This help authoring and processing tool is a script based helpmaker, that generates .hlp files, implements GIF animations and blinking text, that is not supported by the help system itself. Supports context-sensitive help and popup windows for various application features, and is able to generate the documentation from the C source code! currently includes applications and examples that fully explain the the product's features. 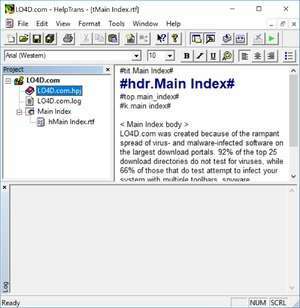 For security reasons, you should also check out the HelpTrans download at LO4D.com which includes virus and malware tests. Additional screenshots of this application download may be available, too. 3.2 out of 5 based on 23 ratings.